While everyone is busy attending to spring-cleaning their home, it’s time to get that pool back in shape. Get in touch with GrandSlam Pool service naples fl and they will help with your pool cleaning and maintenance. While it’s tempting to get your pool ready to jump in it, it’s time to get the outside done first. Make sure that there aren’t any branches or other parts of plants or trees near your pool equipment. Trim hedges, rake up leaves, and attend to flowerbeds. Clean off your deck with a power washing. Skimmers can be cleaned with a powdered cleanser. If you clean your pool first, you’ll have to clean it again after attending to your yard and deck area. Once everything is free and clear of your pool, clean out the mulch and leaves and other debris from your pool pump and filter. Next, it’s time to attend to the pool cover. Remove it, and make sure that all of the water is off of it, and then clean it. This can be done with a hose. However, it’s best to make sure it’s completely dry before storing it away. If it’s stored while it’s wet, it will grow mold and mildew on it. Fill your pool up to the desired level. Be sure to remove plugs from the skimmer and the returns. Place these in the skimmer baskets. If you regularly use an automatic pool cleaner, hook it up to clean the pool. 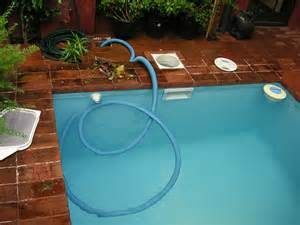 Using a vacuum hose and vacuum head allows for careful cleaning of dirt deposits and film around the pool. Each pool pump is different. Read your pool pump recommendations to get it ready to use. To clean the filter, you can backwash the sand or DE filters. Cartridges can be removed and sprayed clean; however, it’s best to do this twice a year. Use a full water test kit to check for cyanuric acid, calcium hardness, total alkalinity and chlorine. If you don’t have a full water test kit, come in to have your pool water checked. Add chemicals accordingly. Pool chemicals include: clarifiers, balancers, algaecides, enzymes, shock, sanitizers and stabilizers. After you have added the right chemicals, brush the pool and filter. Allow it to sit overnight, and check the levels the next day. On the surface, it can seem like one pool service is like another. That’s until you get to Grand Slam Pools. Dalton Mixon’s vision of what a pool service should look like served as inspiration for starting his business, which is based upon honesty and integrity. Dalton is a Certified Pool Operator. While it’s not required to be a Certified Pool Operator, Dalton went above and beyond what is required to deliver to you the best of service and to provide the utmost of care for your investment. Grand Slam Pools’ services don’t come at a hefty price, though. Their policy is not to sell products or services that are unnecessary. Grand Slam Pools believes in efficiency and keeping the customer’s interests at the forefront. This efficiency translates to delivering to you only those services that you need in a professional manner at an affordable price. You have worked hard to enjoy your pool. You shouldn’t have to pay an arm and a leg to do so. Grand Slam Pools is reliable as well. When they tell you that you’ll be receiving a weekly service, you can count on that. You will get the services you choose on time, and they will be done in a thorough manner. You never have to worry about having honest and reliable service with Grand Slam Pools.